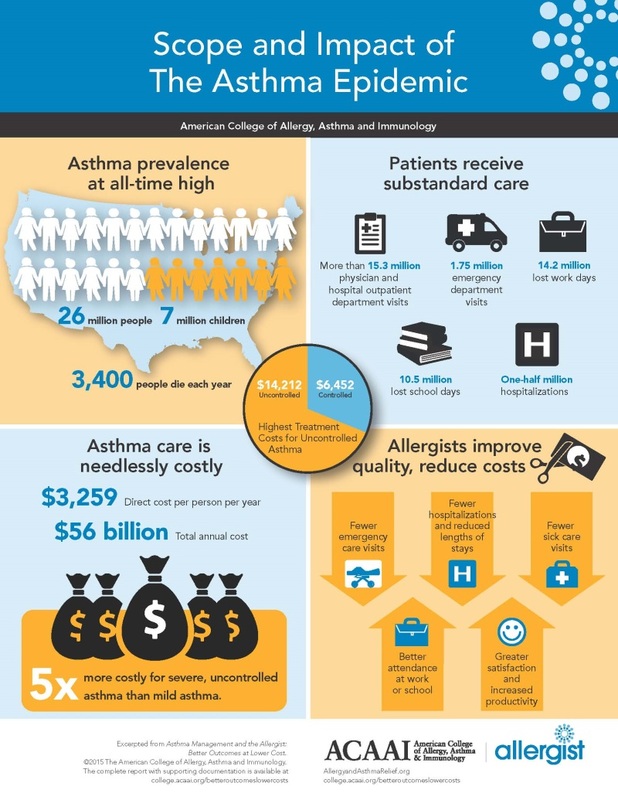 In light of Allergy and Asthma Awareness Month, the American College of Allergy, Asthma, and Immunology has developed an infographic titled “Scope and Impact of the Asthma Epidemic” that addresses vital statistics for asthma sufferers as well as the benefits of consulting an allergist for their care. Uncontrolled asthma causes about 3,400 deaths in the United States every year. 26 million people, including 7 million children, have asthma. Asthma attacks account for 1.75 million emergency department (ED) visits every year – one-fourth of all visits to the ED. There are 14.2 million lost work days and 10.5 million lost school days every year due to asthma. The cost of severe, uncontrolled asthma is 5 times more expensive than mild asthma.